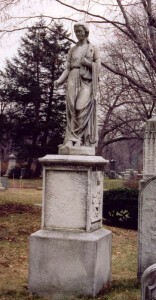 The statue of Hygeia, commissioned in 1870 by Dr. Harriot Kezia Hunt for her grave at Mount Auburn Cemetery, is the only known work of funerary art by Edmonia Lewis in a cemetery. As such, the statue of Hygeia is identified as one of the Cemetery’s most significant fine arts monuments. 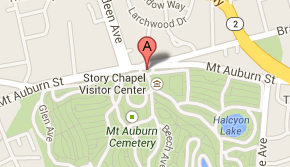 It is featured on the Cemetery’s public maps and is highlighted on the popular African American Heritage Trail Guide to Mount Auburn. One of the first female physicians in Boston, an early feminist reformer and an abolitionist, Dr. Harriot Kezia Hunt helped design the statue of Hygeia, Greek Goddess of Health and Hygiene, for her lot at Mount Auburn. She devoted her life to healing. In 1853 Hunt received an honorary degree of doctor of medicine from the Female Medical College of Philadelphia after twice being refused admission to Harvard Medical School. She practiced in Boston for forty years and was particularly concerned with promoting women’s health. Edmonia Lewis was the first nonwhite man or woman to receive international recognition as a sculptor. Her father was African American and her mother was of Chippewa (Ojibwa) descent. At the time of the Hunt commission, she was the only black professional artist living and working in Rome, Italy. Lewis moved from New York to Boston in the 1860s where she was encouraged by the sculptor Edward Brackett (who carved the portrait statue of Hosea Ballou at Mount Auburn Cemetery). In 1865 she opened a studio on via Canova in Rome, Italy and was received by the sculptor Thomas Ball (who carved the monument to Jonas Chickering at Mount Auburn). Settling in Europe, she had an international career, and was part of the art scene in Italy, France and England. Recognized for bringing a naturalistic approach to the neoclassical tradition of sculpture, very few examples of her work survive. As with many fragile 19th-century marbles placed in outdoor environments, the statue of Hygeia had weathered dramatically over time. Damage was evident early on: Historical records show that the statue had broken by 1902, and that as early as 1877 two bas-reliefs on the statue were falling off the marble pedestal. By 2006, the condition was alarming. The statue had changed significantly, surface deterioration was pervasive, and surface loss had dramatically disfigured the appearance of the statue. Hygeia prior to restoration. Photo by Elise Ciregna. I would love to see before and after photos of the statue of Hygeia. Are any available? Above is a photo by our friend Elise Ciregna of the Hygeia monument prior to restoration.